Today, I received a pleasant surprise. A year or so ago I was contacted by Professor James Leary from the University of Wisconsin. Jim is a folklore historian who was researching material for a book about the ethnic folk music of Wisconsin. We chatted about my Grandfather, who I wrote about here previously, and of his recording session in 1946 that was part of a federally-funded project begun in the 1930s to collect and preserve folk songs of native Americans and immigrants in their own languages. (See my previous blog post: The Sicilian Wedding Singer.) Our email exchanges also revealed that Jim and I had been classmates at Notre Dame. About a month ago an envelope arrived from the office of professor Leary in which a letter was enclosed offering a discount on his newly published book and CD collection entitled Folk Songs from Another America: Field Recordings from the Upper Midwest, 1937-1946. The mailing targeted descendants and family members who served as “research informants” for the individuals whose voices and stories appeared in the book. I ordered a copy without hesitation and it arrived today. Jim included a photo and a story about my Grandfather Accardi in his book. 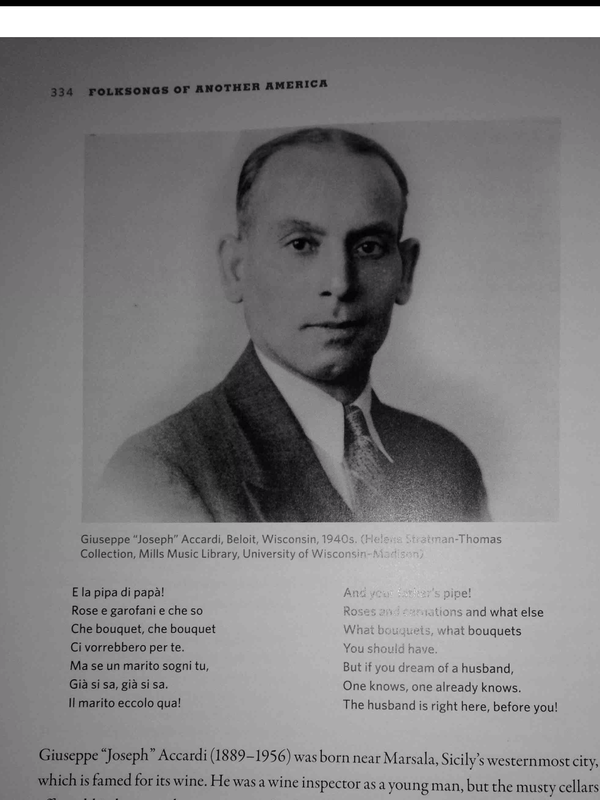 Not only that, an accompanying CD contains a track of Grandpa Giuseppe singing one of the Italian songs he recorded, Tic-ti, Tic-ta. The song’s lyrics, in Italian with English translation, along with its history are described also. What an honor it is to know that my Grandfather’s songs and the folk songs of many other immigrants and native Americans, continue to be relevant decades later in Professor Leary’s “Dust-to-Digital” research and book. Thanks, Jim! Sylvia and I saw Tony Bennett perform with Diana Krall at Ravinia on their “Two for the Road” tour during the summer of 2000. 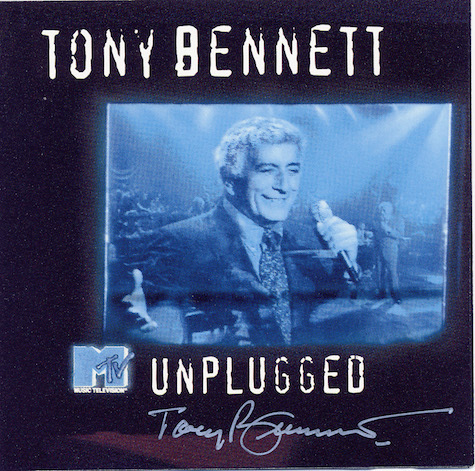 By that time, having known his real name was Anthony Dominick Benedetto, we’d begun referring to him as “Uncle Tony.” Before the Ravinia concert I’d only seen him perform on television, including an appearance on MTV Unplugged in 1994. For my birthday later that year, I scored a CD soundtrack recording of the MTV show. It won a Grammy the following year in 1995. When his autobiography, The Good Life, was published in 1998, I wanted an autographed first edition. Luckily for me, Uncle Tony was appearing at a Barnes & Noble bookstore signing event nearby. The line waiting to buy his book from one of several tables stacked high didn’t appear nearly as long as the line that coiled around the store aisles, fans like me pursuing an autograph. A sales clerk handed me a book as I completed signing the credit card receipt. Then I joined the slow-moving snake of shuffling feet winding their way around bookshelves to a low platform where Tony Bennett was signing autographs, flanked by men in dark glasses looking like Secret Service agents. He appeared almost trance-like until, catching him off guard, I greeted him in Italian, “Zi’ntonio! Come stai?” His eyes blinked a couple of times, then he smiled broadly and responded, “Sta bene!” He signed my book as well as the MTV Unplugged CD I’d brought along. Looking me in the eye he said, “That Unplugged CD is my favorite recording.” I replied that it was my favorite too as he grasped my extended hand. So, I’d have to agree. Uncle Tony is the best singer in the business. Just ask the Chairman of the Board.